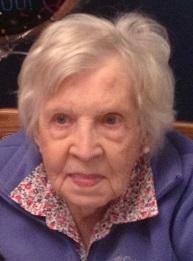 It is with great sadness that we, the family of Theresa Lewis, announce the loss of our beloved wife, mother, grandmother and great-grandmother. Theresa passed away on Saturday, January 6, 2018 in Ottawa, ON, her home for the past four years. She generously shared her love with her family through her deep caring, thoughtfulness and self-sacrifice. Theresa was born on June 25, 1924, the daughter of the late Mary Ann (Morrison) and the late Alexander Campbell. She spent her happy childhood growing up in Whitney Pier, and graduated from Holy Angels High School and the Provincial Normal College in Truro, NS. After several years of teaching, she devoted her life to her husband, Basil Lewis, and to raising her four daughters, Jennifer Chmiel (Adam), Janice Fougere (Gordon), Donalda Dwyer (Hugh) and Denise Eagles (Eric), all of whom survive her. Theresa is also survived by her ten grandchildren, Matthew, Michael and Carolyn (Chmiel), David, Michelle, and Caitlin (Fougere), Alex and Christine (Dwyer) and Sarah and Phillip (Eagles). Also surviving are her seven great-grandchildren, Emma and Brandon Chmiel, Odesa and Slate Charter (Fougere), Abigail and Aiden Fougere-Pepin and Lochlin Eagles. Theresa also leaves to mourn many nieces, nephews and cousins. Theresa, the last surviving member of her family, was predeceased by her ten sisters and two brothers, Louise, Jessie, Martina, Marguerite, Sadie, Mary, Agnes, Genevieve, Veronica, Sister Coline Campbell CND; special sister, Peggy, and brothers, Roderick and Michael. Visitation for Theresa Lewis will take place at T.W. Curry Parkview Chapel on Friday, January 12, 2018 from 2 - 4 p.m. and 7 - 9 p.m.
A funeral mass will be celebrated at St. Theresa’s Church on Saturday, January 13th at 11 a.m. followed by burial at Resurrection Cemetery. In lieu of flowers, a donation to the Cancer Society, the Alzheimers Society or a charity of your choice would be appreciated by the family.